The final room presents the photomontages of Sammy Baloji, together with two final small pieces from MacGarry, whose work runs like a twisted thread through the whole show. 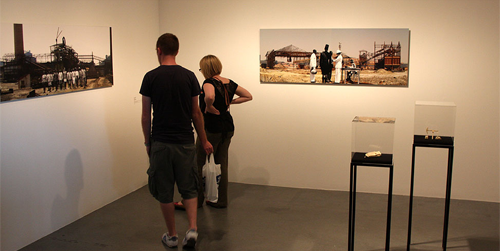 Baloji’s subject here is the history of resource exploitation in the Democratic Republic of Congo, and in particular the decline of the Gécamines mining company, whose presence has shaped his home region of Katanga since 1906. Mémoire (2006) unflinchingly reveals the catastrophic recent fortunes of the company, through a series of desolate panoramas of industrial decline, upon which the artist has superimposed archival images of officials and labourers from more prosperous times. The colonial officials appear oblivious to the state of their new surroundings, blithely peering at dilapidated old sheds and piles of rusty metal, but the Congolese labourers stare straight out at the viewer, photographic ghosts issuing a warning which comes too late.